While attending the festival, one is immediately struck by the beauty and tranquility of the setting. The campus of WCC is located along Moravian Creek and is heavily wooded. The secluded campus could be anywhere in the middle of a forest in the mountains of North Carolina, but here in Wilkesboro it is only minutes away from shopping and dining. 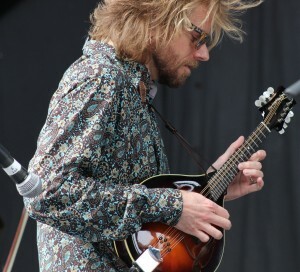 The main stage is located in MerleFest Meadow, a beautiful grassed field that faces the stage. The stage is surrounded by hills and woods, giving a sense of being at grandpa’s house, sitting in his yard and listening to him and his friends pick a few tunes. Each stage location is unique and each brings opportunities to sit close to the stage in the sun or sit back in the shade trees and relax. The festival is easily accessible from US Hwy 421. If you are flying in, both Charlotte and Greensboro are a short hour and half drive from Wilkesboro. When you arrive in Wilkesboro on US 421, take exit 286B and follow the festival signs. The festival offers some limited on-campus parking that can be purchased along with your tickets. Food is always one of the things festival goers are interested in and Merlefest has taken a little different approach to dining. 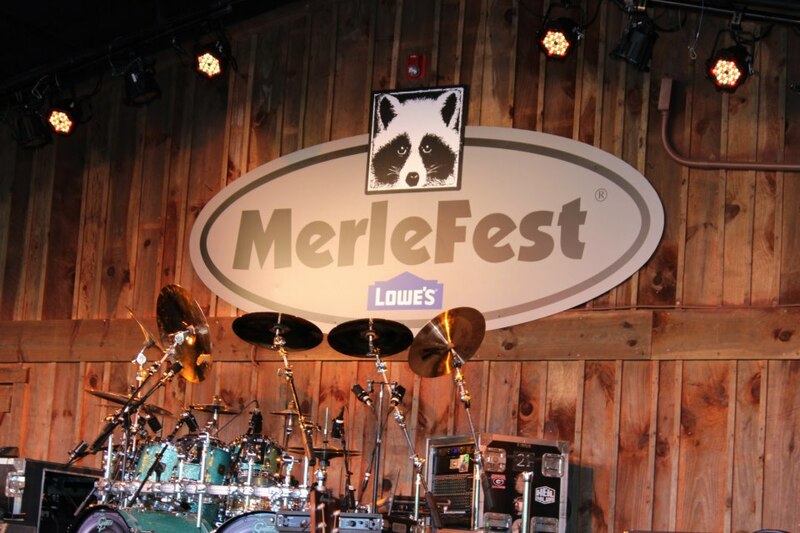 As this is truly a community event, MerleFest has chosen to let local schools and charities provide the food and make some money for their organizations. 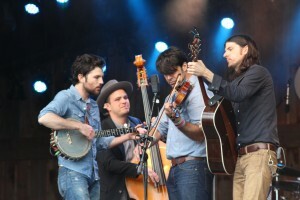 (Well done MerleFest!) The options are varied and the quality is good. If you want to play it safe, burgers and dogs are waiting; but for those that want to remember the experience there are some exotic choices available. From NC pit cooked Bar-be-que to gator on a stick, make the most of your opportunities. Additionally, some tickets include dining provided by the festival. This dining is adjacent to the main stage and is your basic “meat and vegetables”. The best thing about this dining is you never know who might be sitting at the table with you. Over the years, I have had the good fortune of meeting up with some of MerleFest’s brightest stars. I still remember the old days when we would line up on Thursday morning and make the mad dash to get the best location for our chairs in front of the main stage. Times have changed and so have the seating arrangements. 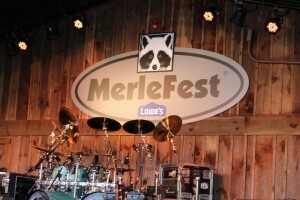 “Permanent” seating is in place in front of the main stage and is available for purchase on the MerleFest website. There are approximately 50 rows of “permanent” (green plastic chairs) seating. Behind this seating, you may find your plot of grass and make yourself at home. Be aware that this festival is “rain or shine” and trust me, I have lived through both. (who could forget Kathy Mattea and four inches of mud?) So come prepared for whatever God has in store from above. One cautionary note, the meadow will completely fill up for the big name artists, so arrive early or stand a long way from the stage. The other stages are first come, first serve. Some seating is provided, but you should have a chair or blanket on your shoulder just in case. Some of my favorite memories of the festival have been at the smaller, more intimate venues. 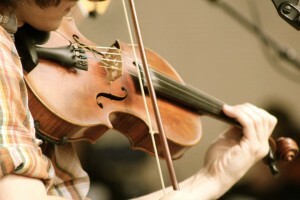 The artists seem freer to laugh and joke with the audience and will listen to an occasional request from the crowd. Additionally, you never know who might show up to jam with the scheduled artists at one of these locations. Regardless of the stage or where you sit, the sound is amazing. I offer kudos to the sound folks for making every seat in the house a great place to listen to the music. For me, sitting in the cool evening air, smelling the camp fires and food cooking, watching the lights dancing on the trees behind the stage with a star filled sky above and listening to the world’s finest musician’s play the music they are so passionate about is difficult to describe. Evening shows in the meadow are moments that my best memories are made of. I can close my eyes and see Doc, Alison, Willie, Vince, Dolly, Doobies, Hootie, Bela, the Krugers, Marty, Sam, Tony and Tut. Sure I enjoy the other stages, but fill up the meadow, turn on the lights, crank up the volume and let it all settle in for the evening. I love it. My wife and I have made these kinds of evenings at Merlefest something that we want to share for the rest of our lives. We talk about it all year long, we wait for the artist list to be released, complain about who got left off and then show up to enjoy those that came. Best experiences are subject to each person’s desires, but this is clear to me…. the festival offers something for everyone and everyone will leave with a “best experience”. I know that the chat around the water cooler on the Monday after the festival is filled with ….. “you got to go next year, brother” and “I can’t wait to see who is going to be there for the next MerleFest”. I have not camped, so my comments are limited to what I have heard. I know that many locations are designated as “MerleFest Camping”. The Towns and County get into the act, along with many private property owners. I have heard the stories of “Sewerfest” and the Park at Rivers Edge and the late night jam sessions. I would advise that you visit the MerleFest website and talk to someone that has festival camping experience to make your plans. Additionally, if you are a serious camper, the festival offers camp sites on campus for camping units. These seem to fill up early, so get in line soon after the festival is over to make your reservation for next year. Good luck! The local hotels fill up early. My best advice is to go online to the brand reservation website and give it a try. Most hotels take reservations 1 year out, so try the day after the festival concludes for the following year. As the festival typically ends each evening with a “big name” act, the mass exodus makes leaving a difficult process at times. Pack your patience; you are in for some line waiting to get on the bus. Make the most of this time to talk with those around you about their experiences that day. Be prepared to talk about who you thought rocked the house, who you danced to and with under the “Hampton Inn Dance Tent”. For those that walked in, a separate lane is dedicated to getting you off the campus. It is the far right lane and moves very quickly. A flash light is handy as you walk over uneven surfaces along South Collegiate Drive. The main thing I would say to you is “be safe”. You’ve had a great day at the festival; don’t let the night end on a bad note. The festival organizers say that Merlefest is about the Music, the Moments and the Memories. I agree. They provide plenty of all three. My take on it is this: Four days of music magic that makes the other 361 days seem long. But then again, maybe the wait is part of the magic… the countdown clock is ticking and the musicians are busy picking…. See you at the festival. What a wonderful article. All the things I love about Merlefest in writing! It’s so hard to try to explain the experience of Merlfest to anyone that hasn’t been, but you have done a good job of it here. It does mean so much more to read this article after you have enjoyed the music, moments and memories. I can hardly wait! I’m losing sleep now thinking about all the fun I’m going to have. Ken, thanks for the comments. Be sure to follow us on twitter @ visitwilkesboro. We will be tweeting throughout the festival with candid photos and artist comments. Additionally, the festival will be giving us any stage updates that occur and we will get those out also. See you at the festival !